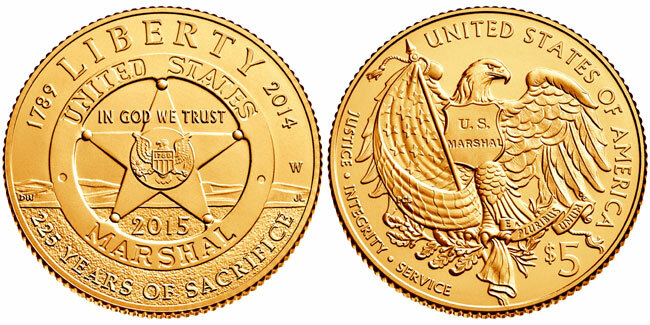 The United States Mint started opened sales for the 2015 US Marshals Commemorative Coins on January 29, 2015 at 12:00 Noon ET. The coins are issued to mark the 225th anniversary of the establishment of the Nation’s first federal law enforcement agency. The program was authorized under Public Law 112-104 and includes $5 gold coins, silver dollars, and clad half dollars issued in uncirculated and proof qualities. Prior to the official start of sales, the US Mint provided the US Marshals Service with a limited number of coins for display and presentation during the official 225th anniversary ceremony held in 2014. The design for the $5 gold coin depicts the U.S. Marshals Service Star superimposed on a mountain range evoking a western landscape. The reverse design depicts an eagle holding a draped American flag with a shield on the eagle’s chest carrying the inscription “U.S. MARSHAL”. The gold coin obverse was designed by Donna Weaver and engraved by Jim Licaretz with the reverse designed by Paul C. Balan and engraved by Don Everhart. The obverse design of the silver dollar depicts U.S. Marshals riding horses across the coin below a U.S. Marshals Service star. The reverse features a depiction of a frontier U.S. Marshal leaning against a post and holding a “wanted” poster with the inscription “WANTED IN FT. SMITH”. The obverse of the silver dollar was designed by Richard Masters and engraved by Charles Vickers with the reverse designed by Frank Morris and engraved by Joseph Menna. The half dollar carries a depiction of an Old West U.S. Marshal and a horse in the upper left and a modern female U.S. Marshal wearing tactical gear in the lower right. 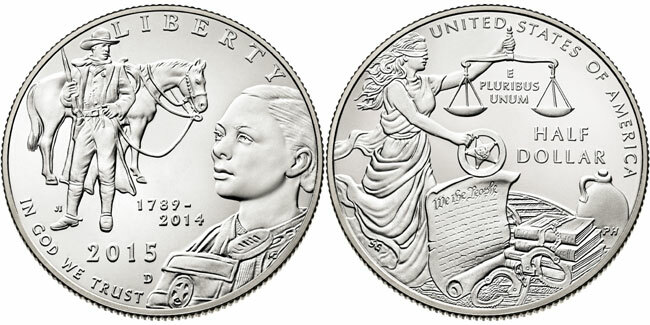 The reverse of the coin depicts Lady Justice holding the scale of justice in her left hand and the U.S. Marshals Service star in her right. Next to Lady Justice is a copy of the United States Constitution, a stack of school books, handcuffs and a whiskey jug, objects symbolizing well-known areas of responsibility in the history of the U.S. Marshals Service. The obverse was designed by Joel Iskowitz and engraved by Michael Gaudioso while the reverse was designed by Susan Gamble and engraved by Phebe Hemphill. Maximum mintages have been established under the authorizing legislation at 100,000 gold coins, 500,000 silver dollars, and 750,000 clad half dollars. Customer demand will determine the ratio of proof to uncirculated coins minted within the authorized mintage limits. The opening prices for the gold coins are $407.60 for the uncirculated version and $412.60 for the proof, the silver dollars are $43.95 for the uncirculated version and $46.95 for the proof, and the half dollars are $13.95 for the uncirculated version and $14.95 for the proof. A three coin proof set carrying a product limit of 15,000 units is also available priced at $473.60. These prices reflect discounts available during the introductory period. After March 2, 2015 at 3:00 PM ET regular pricing will go into effect. The prices for products including gold coins are based on the average market price of gold and subject to potential weekly change. As provided under the authorizing legislation, prices include surcharges of $35 per gold coin, $10 per silver dollar, and $3 per half dollar. The first $5 million of the surcharges will be distributed to the US Marshals Museum for the preservation, maintenance, and display of artifacts and documents. Additional amounts will be distributed in thirds to the National Center for Missing & Exploited Children, the Federal Law Enforcement Officers Association Foundation, and the National Law Enforcement Officers Memorial Fund. Orders for the coins may be placed online at http://www.usmint.gov/catalog or by phone at 1-800-USA-MINT (872-6468). The Mint has also made the the six individual product options for the coins available for sale the Long Beach Expo at the Mint’s booth #1126. Their was no big rush for this coin. Ugly designs, make the silver coins look like cartoons. And the gold coin is just silly looking. Oh well, another lousy coin by the US mint. I wonder if they will ever wake up and take a look at what other mints are doing. I had a somewhat ontopic question for you, Michael – back in late 2012, you posted an article showing the 10 lowest mintages of modern commemorative silver dollars, which can be found here; http://news.coinupdate.com/lowest-mintage-modern-commemorative-silver-dollars-1772/ …all 10 are of the uncirculated variety, and the list is very handy to have, so I thank you for that. However, I was wondering if you could do a followup to this, with the 10 lowest mintages for *proof* commemorative silver dollars. If you could, it would be a great resource, as I’ve not been able to find anything definitive on the topic. Thanks in advance, and thank you for your posts here!